....Compromise is a disgusting thing, especially in a spiritual sense. If you don’t stand for something, you’ll put up with anything. This is a by-product of a Laodicean Church spirit, where lukewarmness allows the world to go by and enemies to arise against the Church, with no heart or strength to oppose it. Which reminds me – I haven’t heard Onward Christian Soldiers sung for years. I wonder why?" 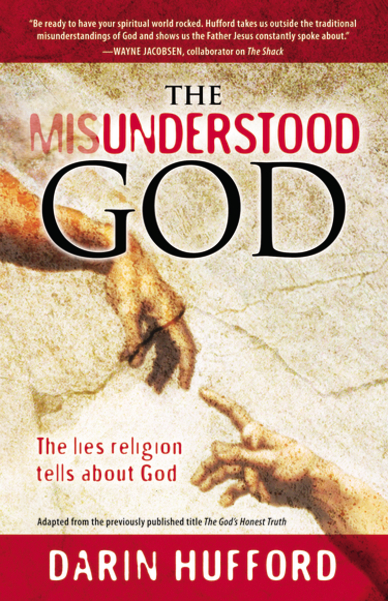 Darin Hufford has written a book with the title "A misunderstood God" and the subtitle "The lies religion tells about God". If you read Swedish or use Google Translation you can read my comment here. 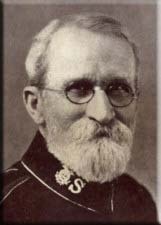 I have just re-read a biography about Samuel Logan Brengle, written by Alice R. Stiles. 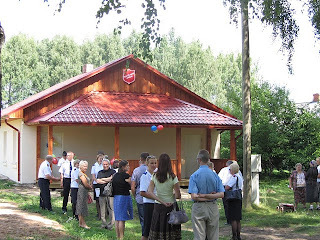 How did Brengle prepare his sermons? “I will pray more for my comrades who are on the field and in the thick of the fight…meditate more…and read and ponder my Bible more, and try to interpret the life that surges all around me…then there are letters I can write to struggling officers on the fields…letters to missionary officers…letters to those who are bereaved, to those…in pain and weariness and…loneliness. These are many good words for those of you approaching retirement age, and for those of us still young. 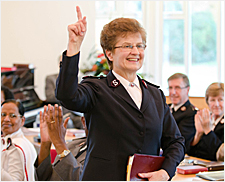 General Linda Bond invites you to take part in a World Wide Prayer Meeting. For more information and for signing up please press here. The Witherspoon Institute - "Presidential candidates in the next election should uphold marriage as the union of one man and one woman." LifeSiteNews - "An online survey carried out in July by the UK’s Premier Christian Media has surprisingly revealed that euthanasia and abortion are issues of greater importance to young Christians than to older believers, whereas older Christians are more concerned with youth related issues than their younger counterparts." TSA international web page - "The Salvation Army in Uganda is responding to the drought crisis that is developing in some parts of the country. As is being seen across the Horn of Africa, people are dying because of a lack of food and water." Greg Laurie - "Idols in our hearts can cause God to refuse to listen to our prayers. An idol is anything (or anyone) that takes the place of God in our lives. Clearly it can be a sinful thing. But it also can be a seemingly good thing. For example, we can make an idol out of a career. There is nothing wrong with a career, but if it is more important than God, then it has become an idol. We can make an idol out of a relationship or out of a husband, wife, boyfriend, or girlfriend. If they are more important than God, then they have become idols. We can make an idol out of money. We can make an idol out of a possession. We can make an idol out of just about anything. And if we have idols in our hearts, then God will not hear us." "Last year an international crisis exploded when Israel stopped a flotilla of ships from breaking its naval blockade of the Gaza Strip. Israel acted to keep weapons out of Hamas-controlled Gaza, but that didn't stop an international rush to judgment. "Turkey was a friend of Israel for much of the last six decades," author Joel Rosenberg told CBN News. "It's a democracy, it's a moderate Muslim country, it's a NATO ally and a friend of the United States, a tourist destination spot for tens of thousands of Israelis, and yet all of that is changing right now," Rosenberg said. Turkey—once a close ally of Israel and the West—is now openly courting the likes of Iranian President Mahmoud Ahmadinejad, Syrian President Bashar al-Assad and ultimately Russia's Vladmir Putin. "Given the fact that Ezekiel 36 and 37 have largely come true—the rebirth of Israel, Jews pouring into the Holy Land after centuries in exile, rebuilding the ancient ruins, isn't it remotely possible that Ezekiel 38 and 39—the war of Gog and Magog—couldn't that come true in our lifetime also?" Rosenberg reasoned." 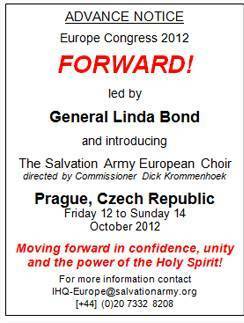 THE Salvation Army's Europe Congress, led by General Linda Bond, will be held in Prague from Friday 12 to Sunday 14 October 2012. "However, in terms of theology, “liberal” has negative connotations of compromised and revisionist beliefs. I’ve been called a “liberal” and I’ve been called a “fundamentalist” by different folks. The term “liberal” is used pejoratively but relatively to describe someone left of where someone else sits on a theological spectrum." An early Sunday morning in Trondheim. We are in the middle of a divisional Congress for the Northern Division in Norway. The theme for the Congress is "Go into His presence - walk out in His power." The Congress started Friday evening with a prayer meeting and a welcome meeting. 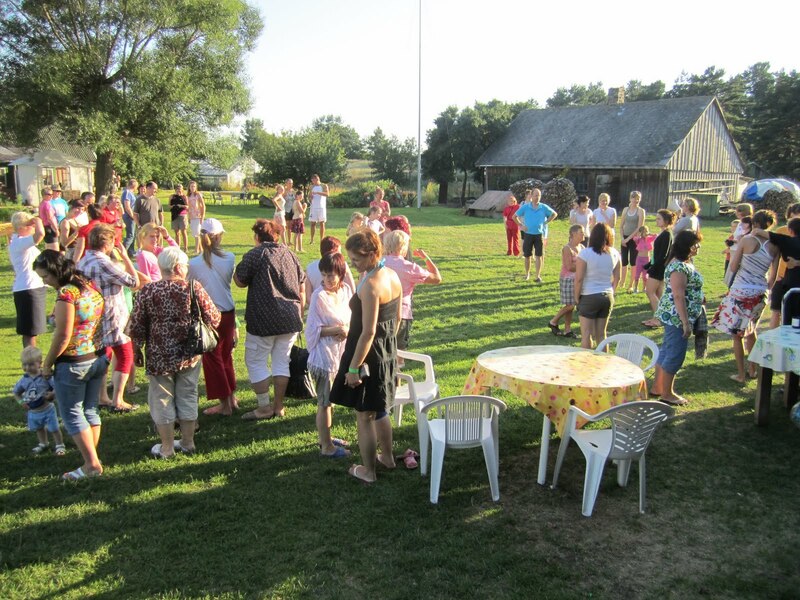 Saturday there was Open Air meetings, Evening meeting and a late "Song service". Today, Sunday, it is a national day of remembrance of the massacre in Oslo some weeks ago. That will be part of the Sunday morning service. After the afternoon meeting it will be time to go to the airport for the return flight back home to Riga. We will come home after midnight if everything works out good. Then it is time for a new work week and I pray that it will be a blessed week for you. There will be a Congress in Latvia June 15-17 2012. 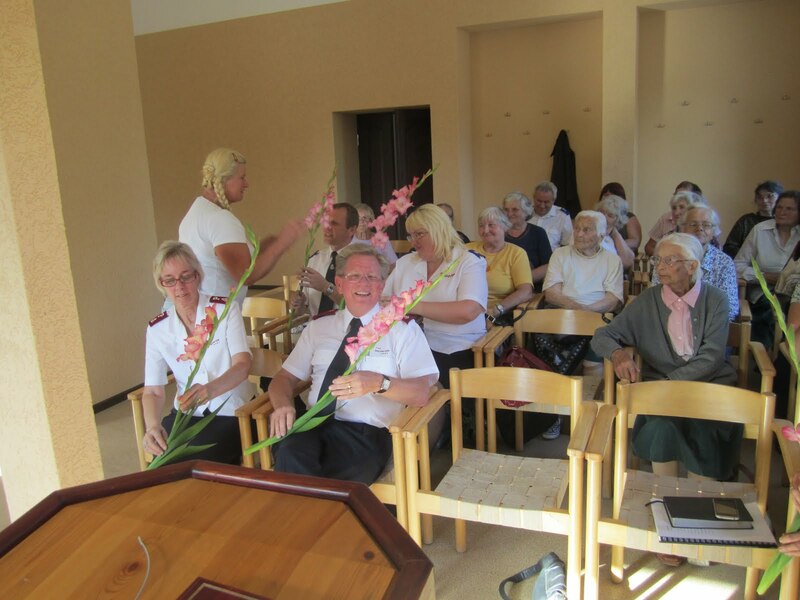 This will be a great opportunity to visit Riga and The Salvation Army in Latvia. Special guests will be Commissioners Robert and Janet Street. During the Congress there will also be commissioning and ordination of the new Lieutenants. The Genreal of the Salvation Army, Linda Bond, is coming to Riga the 4th of December 2011. There will be two meetings with the General at the Riga 1 corps. This could perhaps be an excellent opportunity to visit Riga. 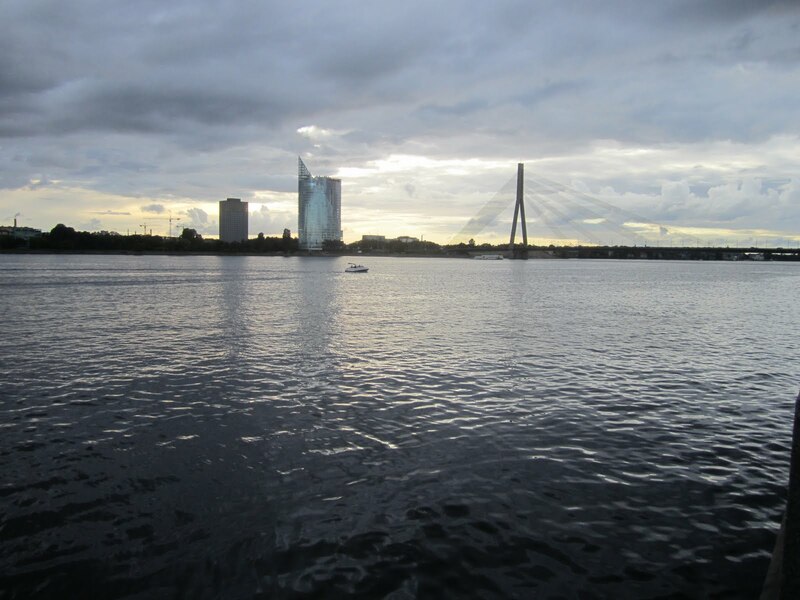 Another great possibility to visit Latvia is the upcoming Congress in Latvia June 15-17 2012. More information about these two events will follow. You can find many more pictures from the Bauska Camp here. This week we have our Childrens´ Camp in Ainaze on the northwest coast of Latvia, close to the Estonian border. It seems as if they have had a rainy week, but there is a good size sports hall at the camp site, so they can at least have good in-door activities. They will come back from the Camp later today with a report. Many of our young people are on camp and many other are on vacation. That means a week at the office with time to do a lot of needed office work. 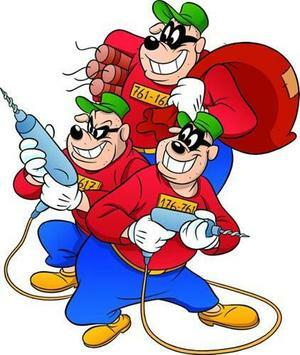 We need to have a lot of things done, because next week will be full of activities. 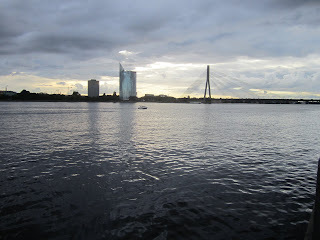 During the week we have had late evening walks down to the river of Daugava in Riga. Looking out over the water we have had our evening prayers severeal evenings during the week. Now it is early Sunday morning and now we will have a three hours drive to the west coast for the Sunday morning service at Liepaja corps. On our way back to Riga we will have the afternoon meeting in Ilmaja and when we come home, this Sunday has almost passed, and there will be a new week around the corner. "There may be a few atheists in foxholes, but a new study suggests that in societies under stress, those who are religious outnumber—and are happier than—their nonreligious counterparts. Where peace and plenty are the norm, however, religious participation is lower and people are happier whether or not they are religious, the researchers found." The communist dictatorship of China wants to replace the US dollar with a new Global currency. 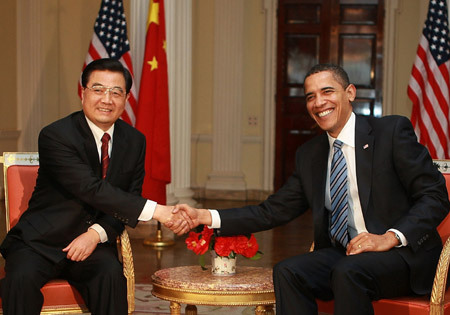 China holds large amounts of U.S. debt . A fresh commentary published by the official Xinhua news agency is critical of the U.S. government and questioned whether the U.S. dollar should continue to be the global reserve currency. The Global elite promotes global solutions. 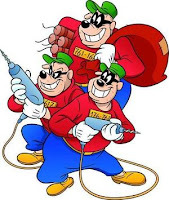 The best caretakers will be a Global Government. This government will get a global currency as a tool, and the new regime will be backed by a large compromise among the worlds religions. On top of it all: A supreme "King", the last and final anti-Christ. Warning! The thief is here! On Sunday we will be driving to the west coast of Latvia again. We will have the morning meeting in Liepaja and the afternoon meeting in Ilmaja on our way back to Riga. In Liepaja I will preach about the thief being among us. He wants to steal, kill and destroy. But we are given an alternative, Jesus has come to give us life, and life to the fullI (Joh 10:10). The thief is stealing from us in many ways. He has stolen Hope for the future from many people. From others he has stolen joy, peace and many other things. But what I want to stress the most is how the thief today wants to steal our faith in the word of God. Because if he succeeds to steal our trust in the Bible then we cannot get saved, be forgiven or have a hope for the future. All these are promises from the Bible and if we do not trust the Bible we cannot trust our salvation or anything else. It used to be that Christians believed in the Bible and non-Christians did not believe in the Bible. But today you hear Christians who do not value the Bible. Some even say that it is not important with the Bible since we can hear directly from God without being dependent on a book. It is of course possible that Jesus can come into our mind, presenting himlself as Jesus and telling us about his death on the cross, how I can be saved and about his coming back to this world. But normally it does not work in this way. The thief has not changed a lot through history. Already in the creation story he tries to create mistrust in the word of God "Did God really say....". He succeeded to steal the life God planned for Adam end Eve and he is stealing the same thing from many people today. Do not let him steal from you! You can trust the word of God. In the Bible you can clearly see Jesus who can save, forgive and give you new hope for this life and the life to come. CSNNEWS - "Muslim-majority countries score worst across a range of measures in a comprehensive new study tracking government restrictions on religion as well as social hostilities involving religion around the world." Canada. com - "Researchers from Concordia University in Montreal report that constant bitterness can lead to physical illness, affecting everything from organ function to immune response and vulnerability to disease." Wesleyan Life - "A new study by the Barna organization shows that church attendance among self-identified Christians has declined by nine percentage points since 1991. Not that that's news to anyone. Everybody who does attend church understands that fewer and fewer people are attending larger and larger congregations. So while many local congregations are growing in size, overall church attendance is declining—even among Christians. Still, it begs the question: Why don't more Christians attend church?" The first Salvation Army officers appointed to the west African country of Togo have arrived, bringing with them their three children and the new Togolese Salvation Army flag. It has been an intensive and great week. 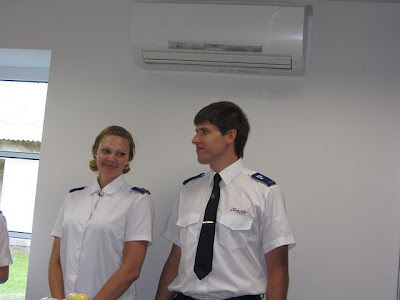 Tuesday we had the welcome meeting for the new corps leaders and two cadets at Iecava corps south of Riga. 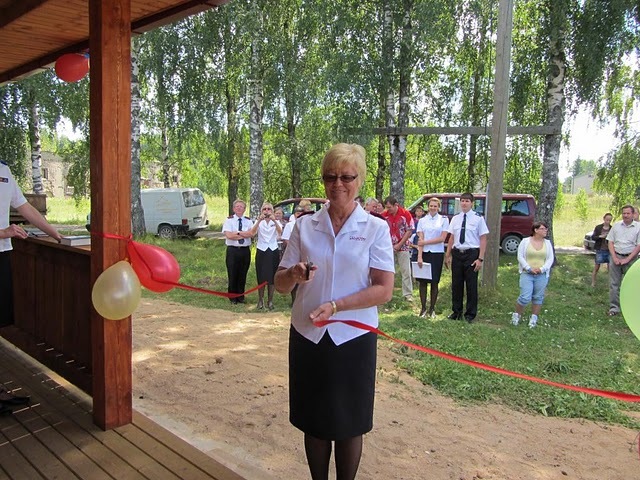 Wednesday was the fantastic day when we opened The Children and Family House in Sarkani village. You can read more about that here. Thursday our Family camp started on the Latvian west coast with almost hundred participants. The beaches and the weather have been great. The teaching, scottish dance, conserts have been perfect. But what really breaks my heart is when children, in the late prayer meetings, come forward to ask us to pray for their parents who are caught in alcoholism.The children should be allowed to be children and not forced to take responsibility for their parents lives. Pray for the children and their parents! Today we have the final meeting at the camp and after lunch we will return to Riga for a new working week. I pray that your week will be a blessed week. This is my sixth and last blogpost from the book "Dearest Lily", which consists of the correspondence between Samuel Brengle and his wife Lily. After the successful time in Norway it seems as if the time in Denmark was filled with obstacles. Brengle is complaining about the small amount of people coming to the meetings, the bad beds in his accommodations and finally Bregnle gets very ill and cannot have meetings for several months. "..I have a letter, a regular brain.teaser from Railton. He had a lot of confessions to make me and wants me to condemn him. He agrees with me in my doctrine of the Holy Spirit, but thinks we should not mention the Holy Spirit to simple people. He does not. And now in SE Europe among jews and Mohammedans he feels he must not mention Jesus, since Jesus and the Father are one, as it only prolongs the schism caused by Paul. And then he wonders why God does not give him results such as Finney saw! He emasculates the gospel and then wonders why it is barren. He doesn´t dare to lift up Jesus and the wonders why people are not drawn unto him. He avoids the offense of the Cross and wonders why he hasn´t power. He feels that God is using me in a wonderful way, and wonders if he and others are unconsciously hindering the Lord from using them in a like manner. His letter teases me. I want to anser it, at once, but I am to weak. He is a dear fellow." It started with a vision one and a half year ago. We saw the children and the families in the village of Sarkani. A village dominated by hopelessness. There is about seventy people living in the village, eighteen of them are children. Most adults have alcohol problems and are unemployed. Several of the grey concrete houses are without water, toilets and heating. The only water coming inte those apartments is from the leaking roofs. We saw in the vision the grey houses turning into colours. We saw a house for children and families in Sarkani. 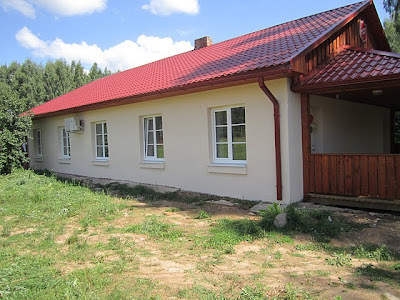 A house with heating, showers, toilets and washing machines, a childrens library and computers. We had only the vision. No money or other resources. But the Lord, who gave the vision, had resources. 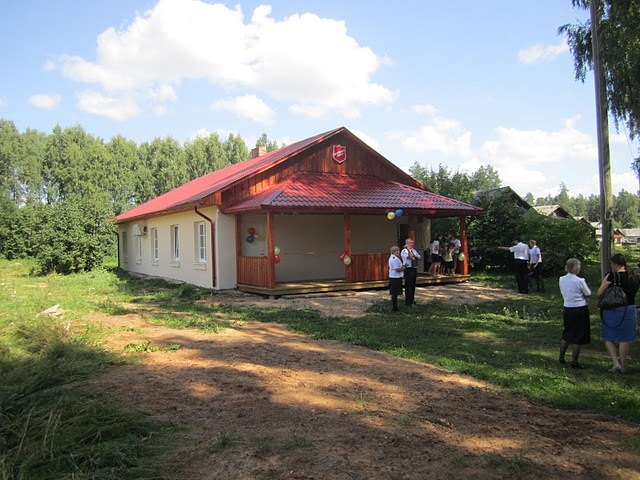 Through several big donations it has been possible to build the house. We bought an old house in bad condition, we drilled 115 meter for clean water and now the house is there. Wednesday August 3 we had the official opening of the house. The junior soldiers from Sarkani read from the Bible and sang a song about building your house on a solid ground. The mayor was touched and had a speech in the full hall. God is good! You write that you can understand my dilemma since you have been there yourself. I do not think you understand my dilemma since i am not aware myself of being in a dilemma. "Where the Bible mentions homosexual behavior at all, it clearly condemns it. I freely grant that. The issue is precisely whether that Biblical judgment is correct." Firstly I do not believe that Mr.Wink is referring to any particular translation when writing this. He is reluctantly admitting that the message in the Bible is that homosexual behavior is wrong, either it is called homosexuality or any other expression describing homosexual acts. Secondly Mr.Wink is using a lot of space trying to explain that what is written in the Bible is not the real opinion of the Bible. And if what is written in the Bible should be the opinion of the Bible, then the Bible is wrong. I think that is a dilemma, but it is not necessarily my dilemma. In the book "Dearest Lily" we can read the correspondance between Samuel Brengle and his wife Lily, while Samuel was out on his preaching journeys. We can read in his letters from Fredrikshald, Christiania (Oslo), Drammen, Larvik, Arendal, Stavanger, Bergen, Ålesund, Christiansund. 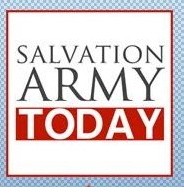 "... Several people came to the penitent form; as we continued to pull, more came, then suddenly the Lord seemed to fall upon us and three women and a big man, the sergeant-major of a neighbouring corps, began to shake and shout and praise the Lord. The sergeant-major was getting up to come to the penitent form when his strength went and he fell in the aisle. He tried to get up, but he could not, and God blessed him there. His face shined and he said: "I would not miss this for all the world!" Of course not, for it was the blessed Lord of all worlds who had come to his heart. For a time we just had to let the meeting run itself. The visiting officers had never seen the like before and they were amazed, and wondered and laughed and wept. That sergeant-major is a godly fellow, well known and none of them doubted the genuineness of the work in this case..."
"It was estimated that 2,000 people came down to the boat in Stavanger to see us off..."
And from the farewell in Bergen he writes on May 11, 1907. "But the most amazing thing was the crowd of between 5,000 and 6,000 people who came to the boat at 11 o´clock to see us off. The great pier was black with people and they stood for about one half an hour in the rain till we were out of sight." It is evident that Brengle experienced a fantastic break-through in Norway. 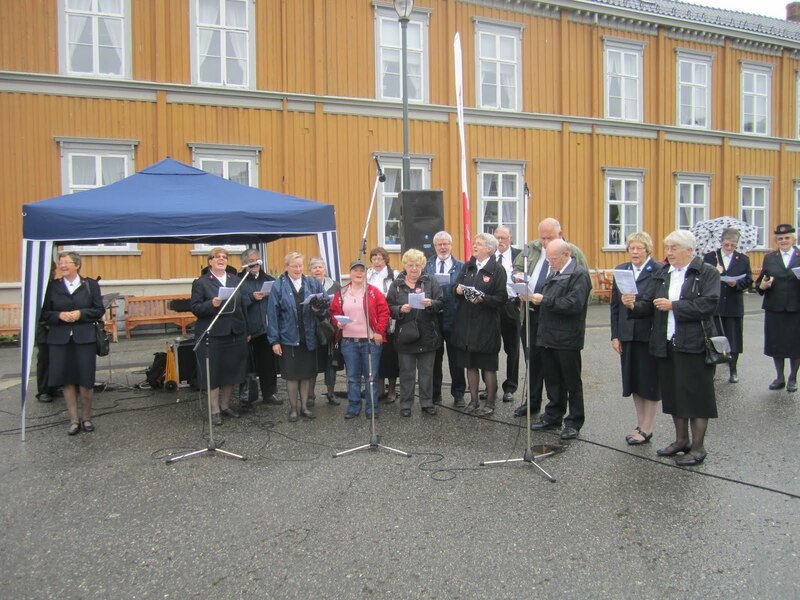 The following campains in Finland and in Denmark are witnessing about a harder spiritual soil. 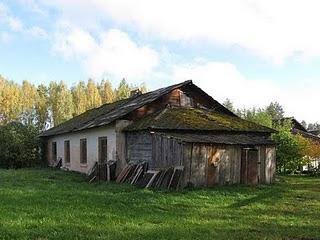 I will end the glimpses from Brengle´s letters to his wife with a short report from the trip to Denmark and also about what Brengle is writing to Lily about commissioner Railton. On fsaof.blogspot.com there has been a number of articles dealing with the subject of homosexuality. Most of them, and also of the comments, are positive to accepting a homosexual life style. "The truth is, we are not given unequivocal guidance in either area, abortion or homosexuality"
Everytime the Bible is mentioning homosexuality it is definitely warning against homosexual acts. How is it then possible to say that we are not given guidance about homosexuality in the Bible? Here he clearly admits that the Bible condemns homosexual behavior, but then he indicates that the Bible is unreliable. And if the Bible is unreliable what is Christianity based on? "And that word is a Person, not a book." When I read this I remember a former archbishop in the Swedish Lutheran church who said: "I do not believe in a book , I believe in Jesus"
The problem, both with the archbishop and Walter Wink, is that evereything they know about Jesus, they have read in the book, the Bible. All other information they might have about Jesus is produced in their own thinking. But we do not have to produce Jesus in our thinking. God has chosen to reveal himlself in the Bible, and if we do not believe in that revelation our revelation is self-produced. The archbishop also said that large parts of the Bible should have been thrown in the garbage bin several years ago. If you have that view of the Bible, then you are of course free to adopt any moral laws which happen to be politically correct.